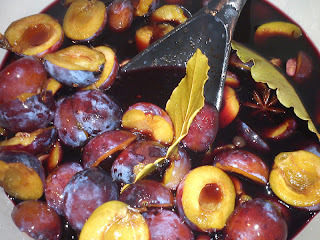 Continuing with my modification on this favourite plum dessert of mine, I have again made a few changes to this recipe used Lønnestræde´s plums in spiced red wine - year 2012. 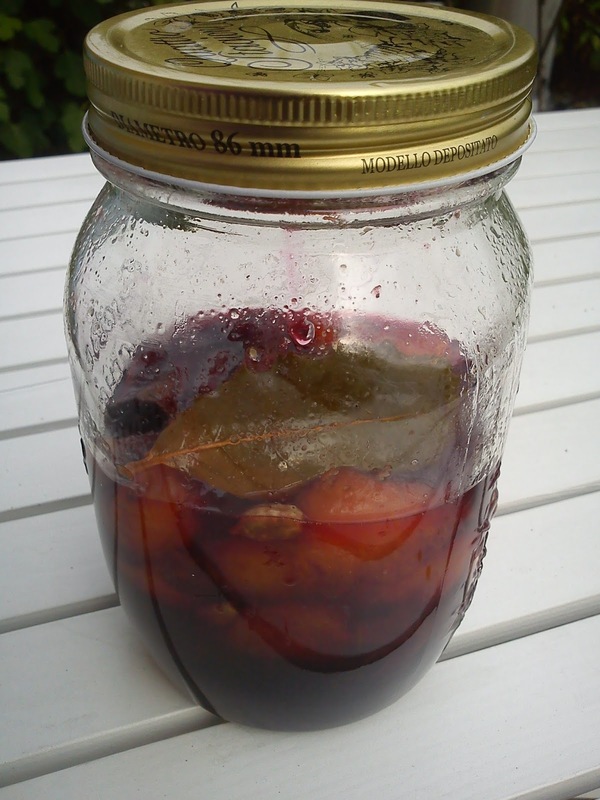 Again I looked into, what my kitchen cupboards had inside them, and what I felt like putting into the red wine. Sometimes I do not have a lot of time to both cook a meal from scratch in the evening, and here it can be difficult to find a fast and good solution for such occasion. 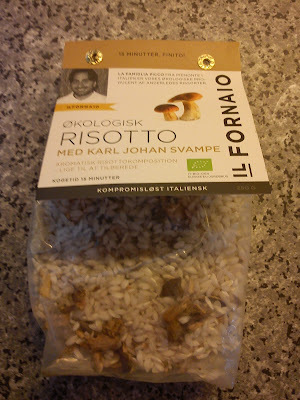 Recently I found this solution in my local supermarket in form of risotto with Karl Johan mushrooms from Il Fornaio, which contains two servings. The plastic bags contains all the dry matter for the risotto. As other ingredients you need as well to have olive oil, white wine and Parmesan cheese in your kitchen, ingredients which my kitchen always have inside. The parsley is an optional extra ingredients. The total cooking time is 15 minutes, which is the case for making your own home-made risotto, so the time saving element is the fact, that you do not need to make any ingredients preparation, as you simply add the entire bag into the cooking pot and no shopping is neither as well. 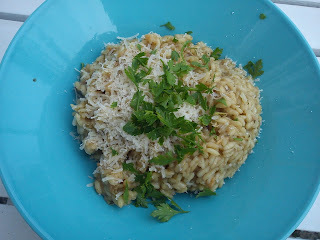 The taste was excellent and reminded me about a home-made risotto prepared to the bottom. I can certainly see myself buying some bags of this risotto. During a one-day trip to Sweden with my mother during Easter 2013, we visited an outlet area in Höganäs, Sweden, and here I found various new things for my little kitchen, which I as usual "could not live without" such as this herb watering pot and this silicone hand protector !!!! 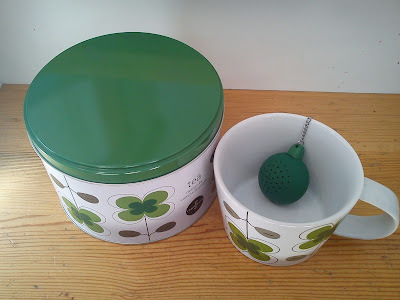 I also brought this big tea cup with green flowers as decoration and a green tre strainer again from Sagaform (costing 99 SEK). So now I be able to sit in my little garden drinking a cup of tea full of flower and enjoying my garden being full of flowers. I am in a period, where I am having a caving for Greek yogurt (I suppose you could call this caving trendy) either for breakfast or as a snack in the afternoon or evening. 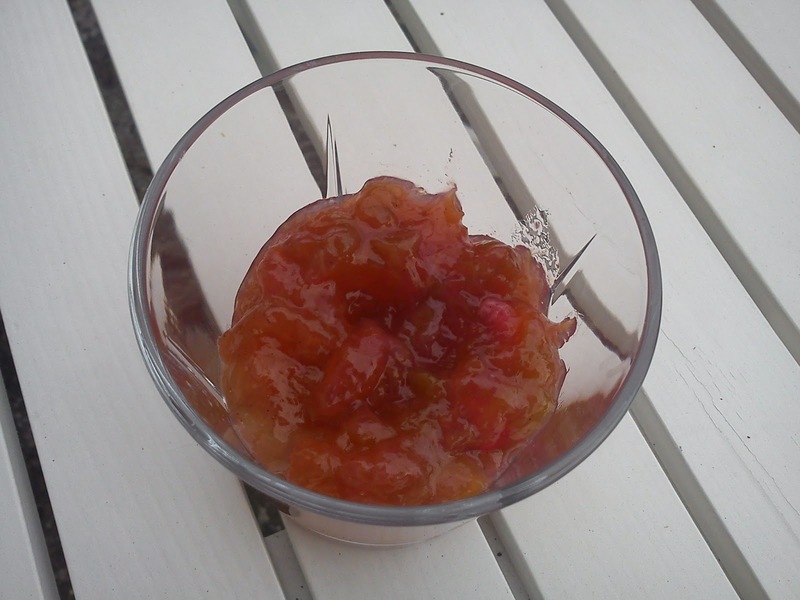 I have enjoying plenty of this Greek yogurt with rhubarb compote and honey roasted muesli during Summer. The only issue is, that the rhubarb season is more or less over, so I am forced to find a new way of enjoying Greek yogurt. And suddenly I remembered one of yogurt, which I enjoyed in New York this spring, Greek yogurt with blueberry and blueberries are in season right now here in Denmark, or rather it is more correct to state that blueberries are in season in Poland, which is much closer to Denmark than blueberries coming from Chile during the winter season (I suppose you could call this being sustainable ?). 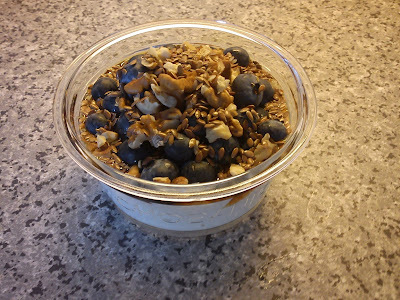 Fill blueberries on top of the yogurt followed by maple syrup, chopped walnuts and linseed. Most Monday evenings during the rowing reason I spend rowing on the fjord of Vejle, which means I drive directly from work to the rowing club, jump into the boat and I spend the first 15 minutes sitting on the coxing seat, while eating a bun with either cheese or ham. 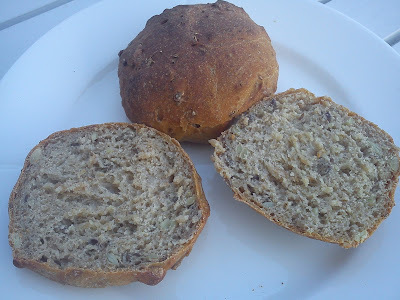 So on a regular basic I need to stock my freezer up with more buns for the rowing tour on a Monday evening, so I spend time looking for new recipes mostly located in the bread book "Hjemmebagt". However, this time I have found this recipe on kernebrød on the home-page of Skærtoft Mølle, and instead of baking bread I turned the dough into buns. Start by mixing the cracked rye grains, salt and water together in a mixing bowl, let it rest cold for minimum 8 hours or night over. Add the soaked cracked rye grains into a dough bowl, add the rest of the ingredients as well. Divide the dough into equal size buns, I always a kitchen scale for this purpose in order to ensure equal baking of the buns, I target a dough amount of 80 g per bun. Bake the buns at 200'C for 20-30 minutes in the upper part of then oven. 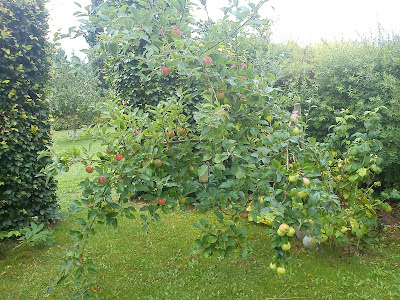 No clue what to do with the last of this season´s rhubarbs ? If you are in the lucky situation that you still are having rhubarb growing like maniachs in your garden or perhaps in a garden belongs to friend ? 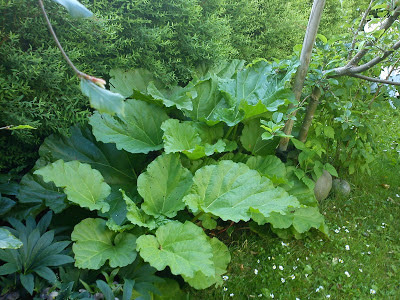 You really need to use this opportunity to use these rhubarb for various great tasting food stuff, as the rhubarb are getting to the end of their season. 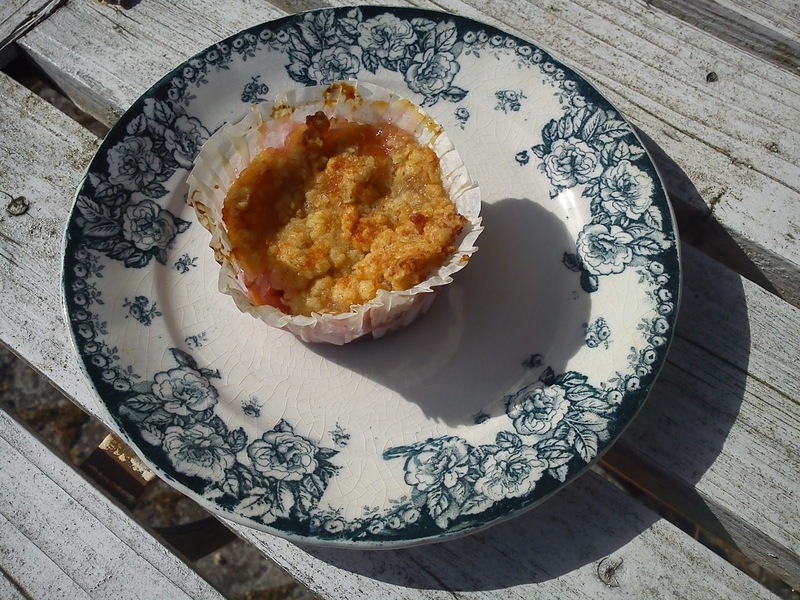 Or perhaps you have a freezer full of rhubarb to use during the coming Autumn and Winter ? If this is the case I would like to share a selection of recipes having rhubarb as the main/important ingredients. 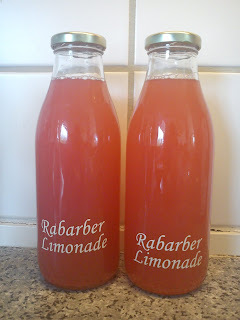 You can make various types of rhubarb cordial sush as a la Camilla Plum, a la Årstiderne, a la Dansukker, a la Perch Hill or just this . 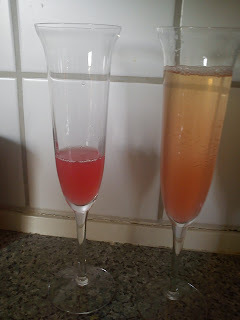 As I still had some rhubarb stems left from my visit to the garden in Horsens, I decided to make the very last portion of rhubarb cordial of 2013 !!!! This time I used another old recipe clipping from a Danish magazine, where I again have no idea of the original source. Have a look at the picture of this rhubarb cordial, is it not an amazing dark red colour it is having ? Wauuw I am crazy with this red colour, which I know my cousin will be as well. 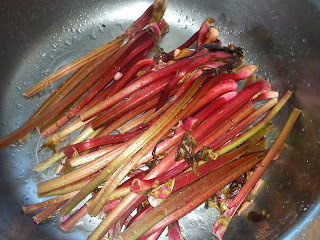 Add water, sugar and rhubarb into a the cooking pot. Cook it up and left it cook for 5-10 minutes. 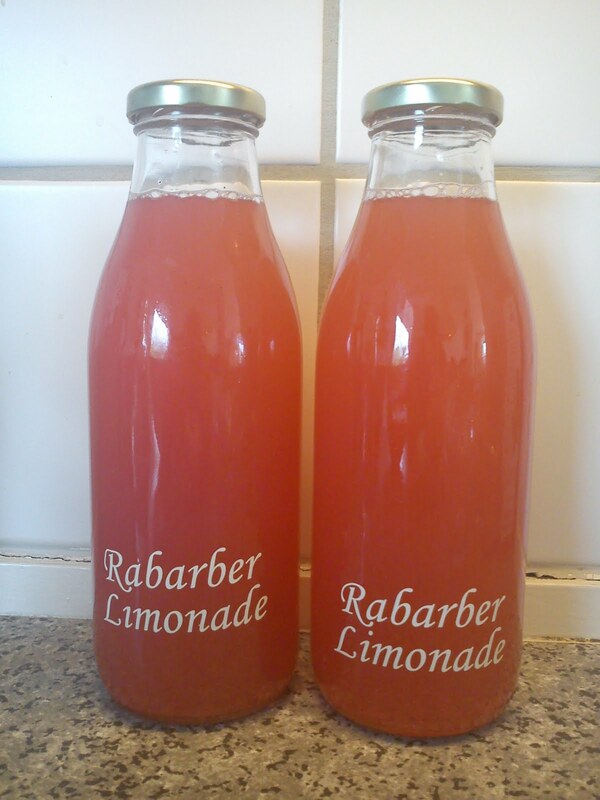 Pour the rhubarb cordial into bottles, which have been standing with boiling water for 5-10 minutes. The rhubarb pieces in the sieve can be turned into a rhubarb compote, which I decided to do. 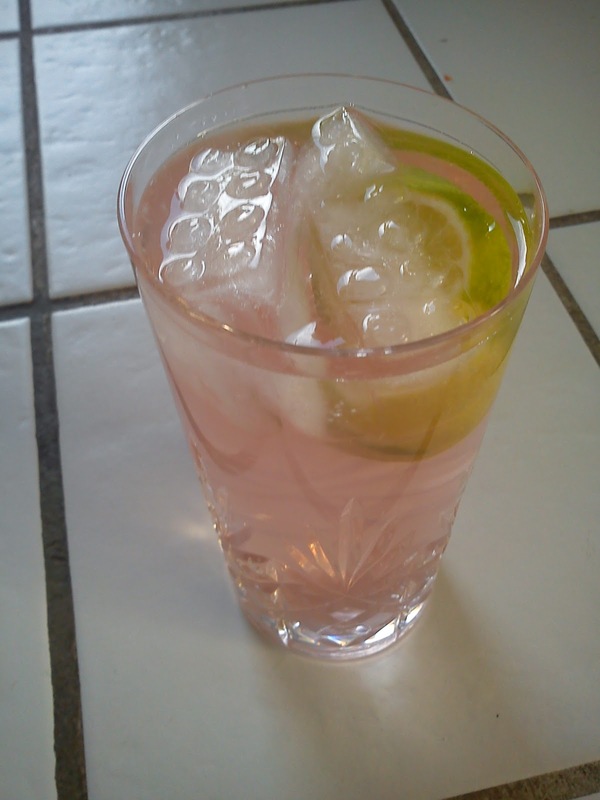 I add sugar until desired sweetness level and juice of ½ lemon. 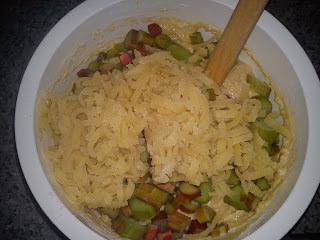 Stir everything well together and place the rhubarb compote in the freezer for later use in desserts. 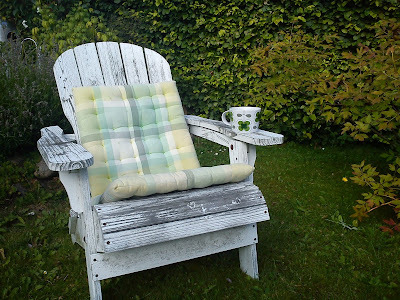 The Tea Time Treat for this month of Summer is hosted by Kate from What Kate Baked (being the hostess of the virtual tea table), and she selected has selected a very relevant theme in form ice creams, jellies and chilled desserts. And I right away set my heart on making ice cream as a celebration of Summer time. 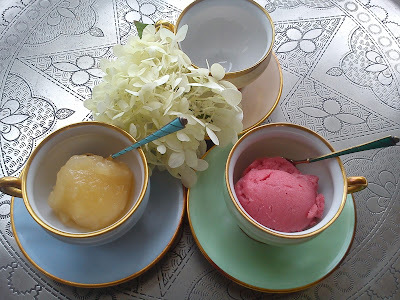 Well it is more correctly to refer to my contribution for this virtual tea time table as a sorbet, as the recipe is containing no milk or dairy cream at all. This is another old Dansukker recipe, which I again found some years ago. However, I have been unable to locate this recipe on the home-page of Dansukker, so I can not the original recipe with you. The good thing about this apple sorbet is, that is was more easy to locate the main raw material for this sorbet, as we are actually approaching the season of this fruit instead of been moving out it´s season as this case is for the rhubarb, which I used in my first contribution on rhubarb sorbet for this monthly tea time table. I have made two changes to the original recipe, as I decided to remove the use of Calvados from my version of this apple sorbet. 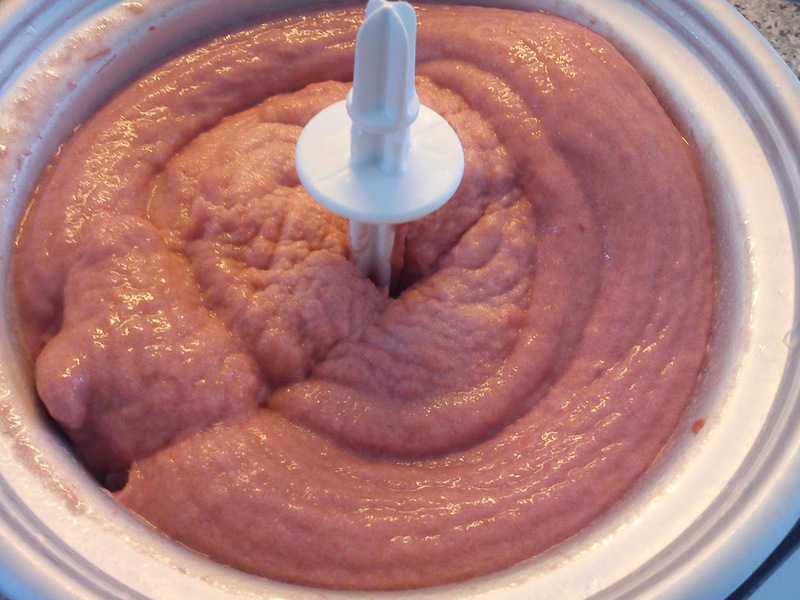 Addition of alcohol into ice cream or sorbet is lowering the overall freezing point of the ice cream and thereby making it more difficult to freeze the ice cream at home in your own kitchen. Lowering the freezing point also means, that the ice cream/sorbet becomes more soft (less hard = more easy)), when you scoop the ice cream directly taken from the freezer. 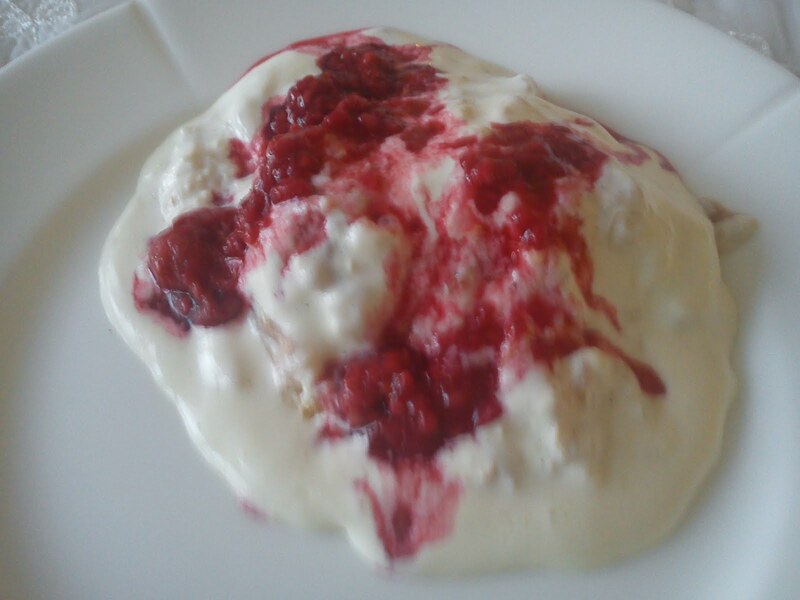 The second change is, that I have removed the egg white as well. 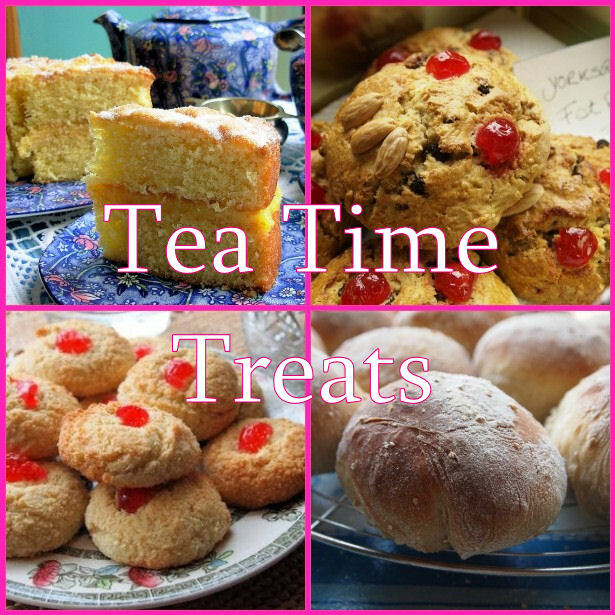 The Tea Time Table is a monthly blogging event managed Karen from Lavender and Lovage and Kate from What Kate Baked. Boil the apple pices and 200 g water together, untill the apple pieces have cooked out. Blend the entire apple mass together. 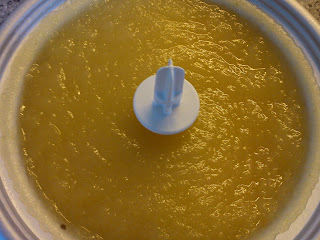 Add lemon juice and lemon zest into the apple mass. Cook up the sugar and the rest of the water. 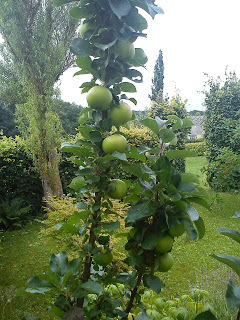 Add this sugar syrup into the apple mass. Cold down this apple mix for min 4 hours or night over in the refrigerator. Run the apple mix on the ice cream machine for 25 minutes. 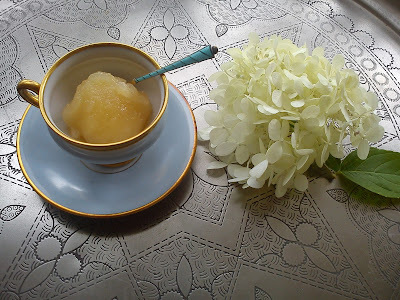 Place the apple sorbet in the freezer. The Tea Time Treat for this month of Summer is hosted by Kate from What Kate Baked (being the hostess of the virtual tea table), and she has selected a very relevant theme in form ice creams, jellies and chilled desserts. And I right away set my heart on making ice cream as a celebration of Summer time. 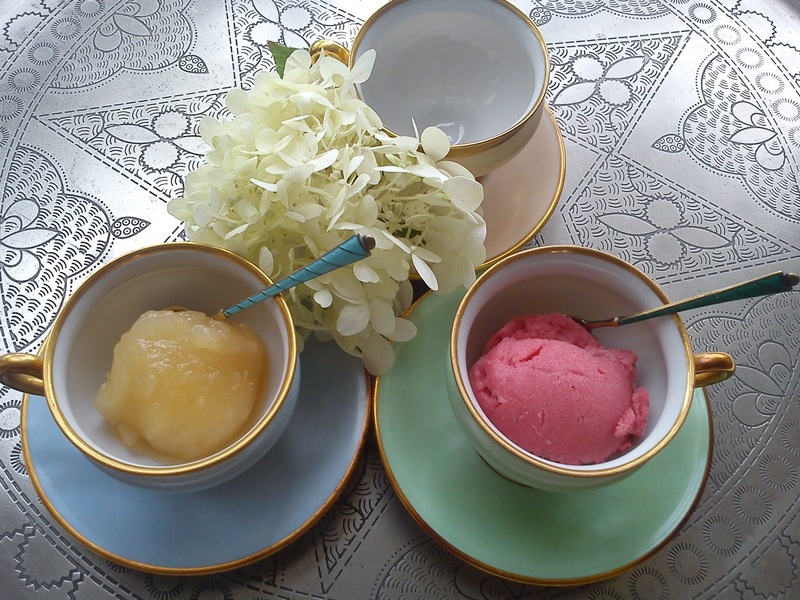 Well it is more correctly to refer to my contribution for this virtual tea time table as a sorbet, as the recipe is containing no milk or dairy cream at all, and therefore can not be referred to as ice cream ! I have keeping this specific recipe as a clipping for some years or more without getting around to make, so I grab this opportunity to make it for this blogging event. 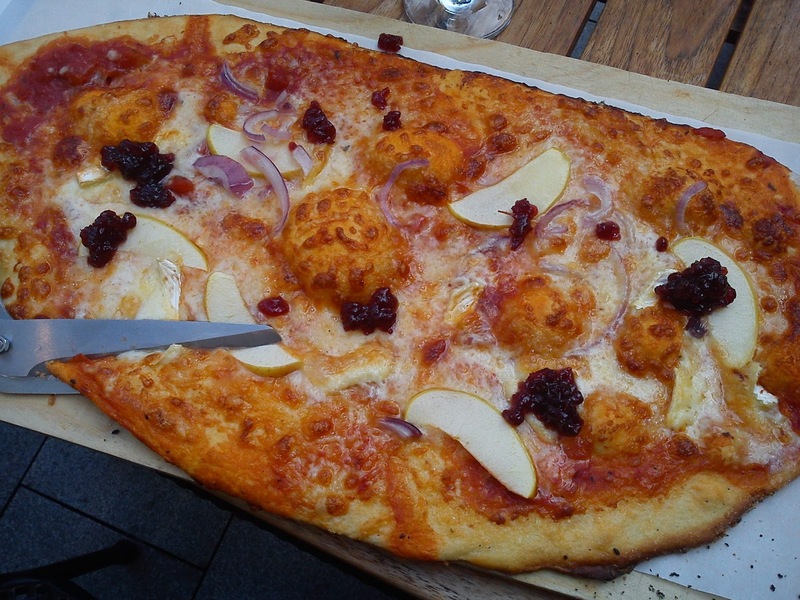 I have no clue, where I originally have found this recipe, but it is coming from a Danish magazine of some kind. 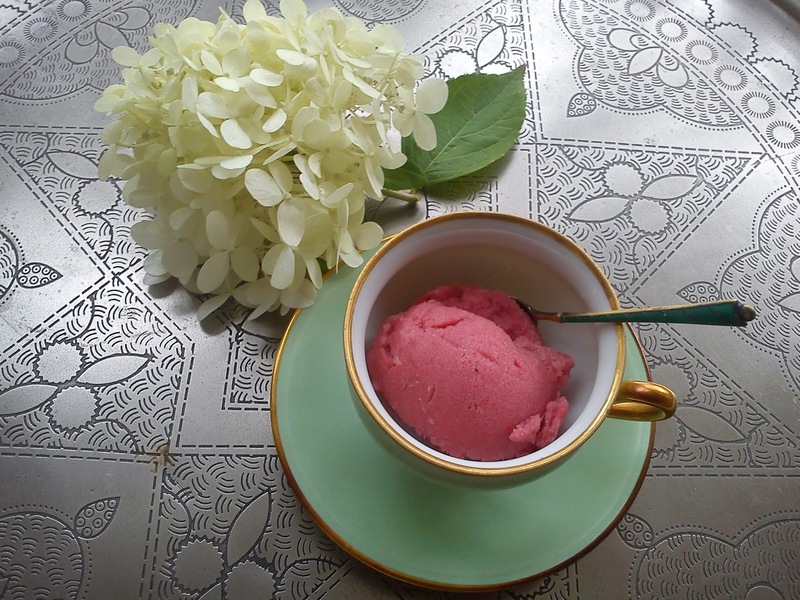 The rhubarb sorbet has a refreshing and rich wonderful taste of rhubarb. Boil the rhubarb pieces, water and sugar together, untill the rhubarbs pieces have cooked out. 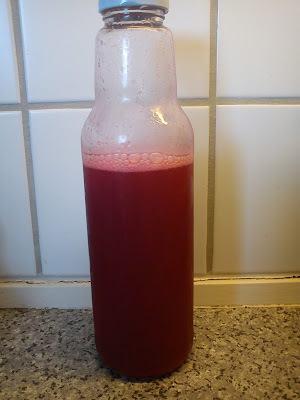 Blend the entire rhubarb mass together with glucose syrup. Cold down this rhubarb mix for min 4 hours or night over in the refrigerator. Run the rhubarb mix on the ice cream machine for 25 minutes. Place the rhubarb sorbet in the freezer. As tradition demands (hereby assuming that twice makes it a tradition) one evening during the annual Summer rowing tour is spend eating some great food. Last year, being the first year doing that, we went to Rudolf Matis in Kerteminde celebrating our rowing tour around Fyns Hoved. 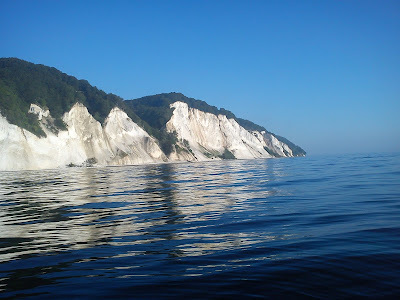 This year we went to Gourmet Gaarden in Stege celebrating, that we managed to row around the island of Møn from Vordingborg seeing the wonderful view of Møns Klint (The White Cliffs of Møn), which is such a spectaculars view of blue sea, white cliffs and green beech forest as topping on the cliffs. 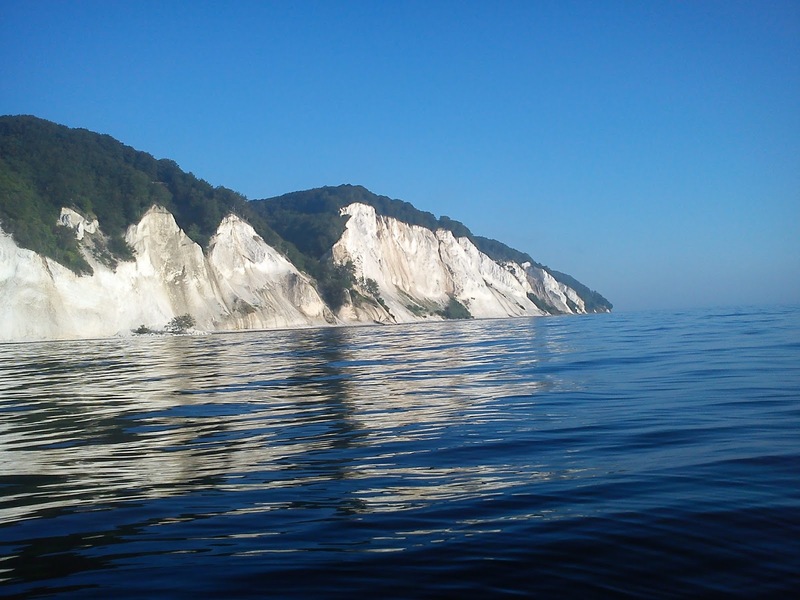 Møns Klint is the second most windy place in the country of Denmark, what the most windy place I have no clue about. The menu card is quiet small at Gourmet Gaarden, basic two starters, two main course and two desserts, but this is actually quiet nice in my opinion, as I many times get lost, when I have make a decision from a menu card full (too full) of options !!! 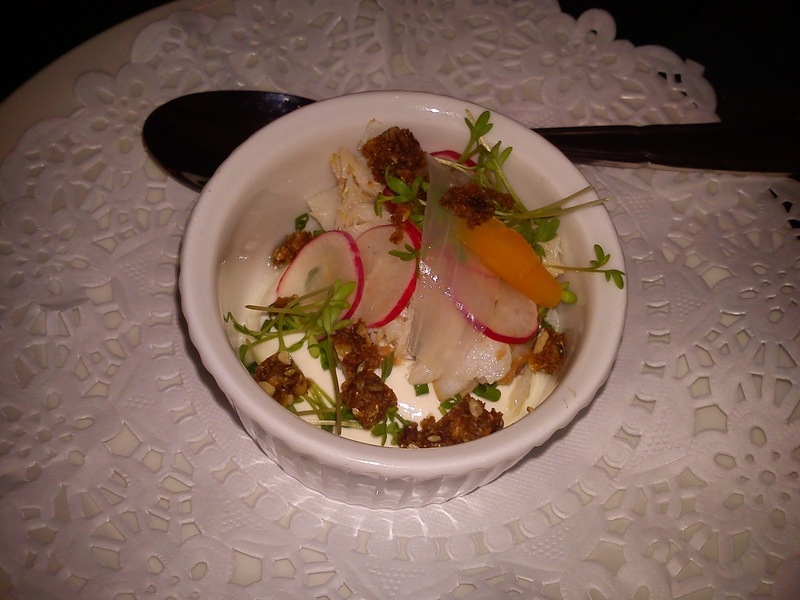 As a small appetiser we were served smoked cod with smoked fresh cheese, radishes, onion and roasted rye bread. 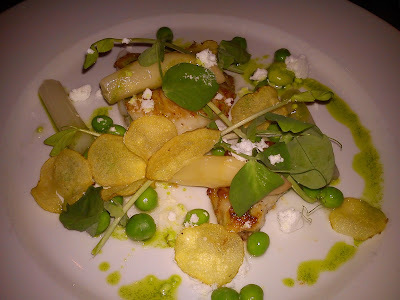 We all went for the season menu, which was a starter with fresh fish from the local harbour (Klintholm Havn) served together with dill oil, dill mayonnaise, dill "snow", white asparagus pickled in French white wine vinegar, fresh peas and hand-made potato chips. 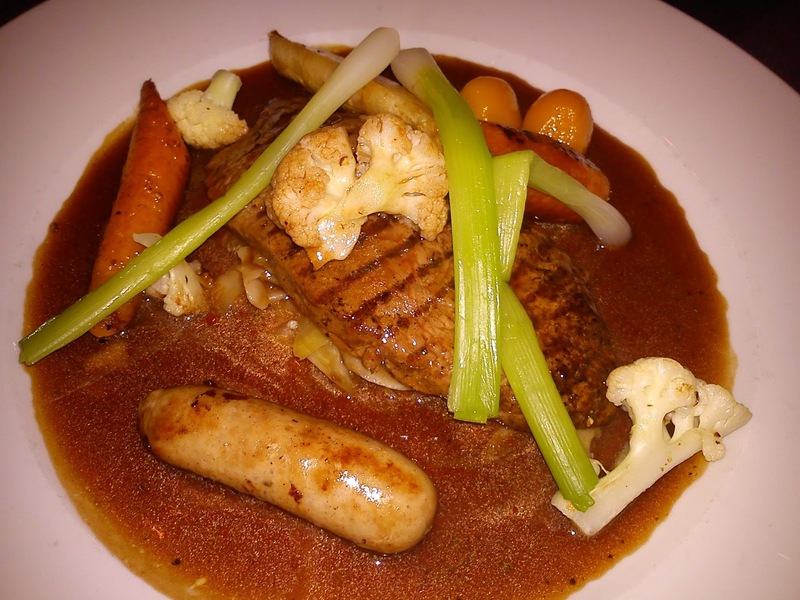 Great flavour combination and nice look, the asparagus was just great in taste. As main course we were served Danish veal fillet, a sausages made of the same veal meat, potatoes and "green stuff" of the season together with a great sauce made on veal. Of the two veal part the sausages was actually the best tasting part . As the finishing touch (as yes you can eat a lot, when you have spend between 5-8 hours rowing) I had dessert. 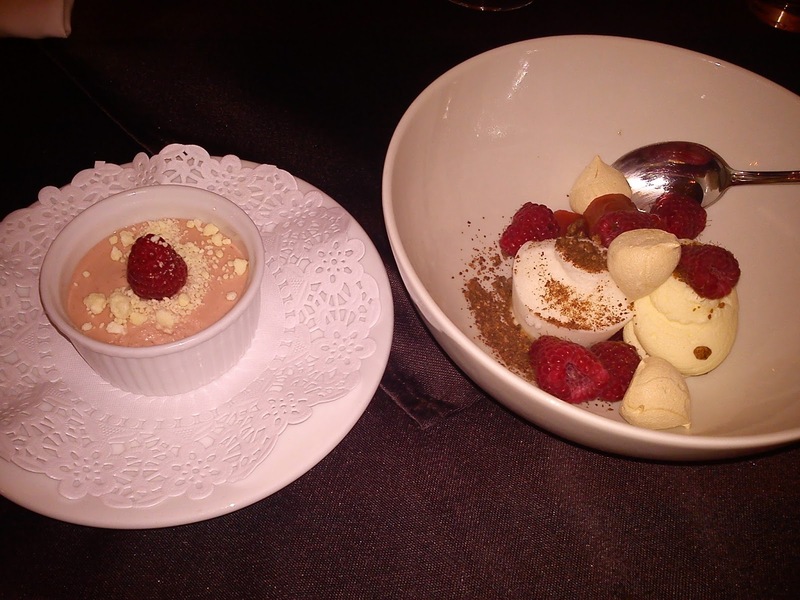 One part of the dessert was raspberry mousse served a single fresh raspberry and white chocolate. The second part of the dessert was ice cream made from ymer (fermented concentrate dairy, almost like Greek yogurt, but fermented with a mesophilic starter culture as in buttermilk, ymer is known only in Denmark), white chocolate cream, fresh raspberries and liquorice meringue. This was a fantastic finish for a evening full of great food. A tree course menu costed 365 DKK, which really is value for money in this case, so if you are in the neighbourhood of Stege you should do yourself the favour of eating at Gourmet Gaarden. If you are suffering from any kind of allergy you need to tell this in advance, when you book the table, so the chef can prepare him self for this challenge. 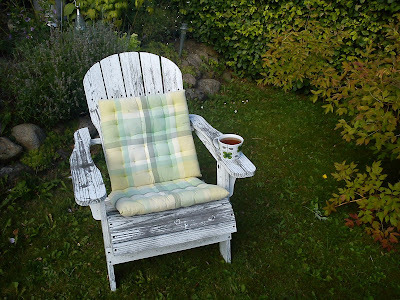 My only little negative remark to this evening at Gourmet Gaarden is not at all related to the food, but to the chairs :-( We were setting on some chairs without armrests, which at the same time was too high for people with short legs. So if the chair had been better, I would have given this experience 6 stars, but due to the chair I end up with 5 stars !!! Again I have been invited in for free picking of mega blackcurrants at my friend´s garden in Horsens. I could have turned these blackcurrant into a more normal blackcurrant jam. 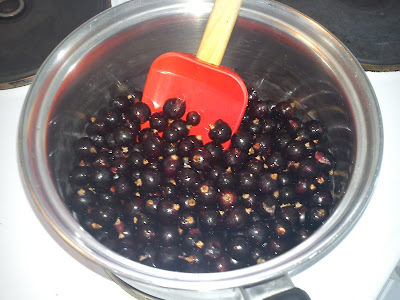 However, over a cup of tea after the berry picking process we discussed various options for twisting blackcurrant jam, and one option was to included liquorice, which I went back and actually did in my little kitchen. The liquorice addition is giving a interesting flavour twist on top of the blackcurrant flavour. During my flavour adjustment process, I found that this jam with liquorice was becoming to sweet and mature in it´s flavour, so therefore I decided to add in some lemon zest and lemon juice to bring back freshness in the jam. Heat up the blackcurrant and jam sugar in a cooking pot together with a small amount of water. I use extra water in order to avoid burning at the bottom of the cooking pot. Add in the raw liquorice, sweet liquorice, lemon zest and lemon juice. I normally add it smaller steps, so I can fine tune the flavour profile to my preference. It is more easy to add some extra, than to remove an overdose of something. My mother and I have been away on another vacation trip to Germany, where we this time went to Kiel staying at a hotel located in the very city centre for 2 days. 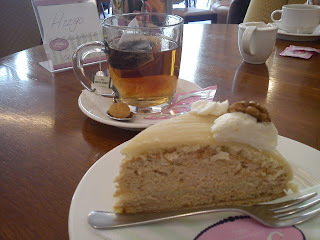 And as usual we went looking for a cafe or patisserie, where we enjoy some great cakes together with a cup of coffee and tea. As usual it took us some time to locate the right place, so the first afternoon we only found a cafe without a big selection of cakes. And right after we had eaten our cake there, we continue our walk around in the city centre and of cause found a much better patisserie to have cake and coffee 3-4 minutes walk away. How many times is this not the situation, when you are looking for something specific like a restaurant, cafe or dress. You can not find the right place, however you need to eat/buy something and after you have eaten/brought, many more options turns up with a much better selection !!! Do you know this feeling ? So the day after we went straight to this patisserie called Cafe Fiedler for our afternoon break. 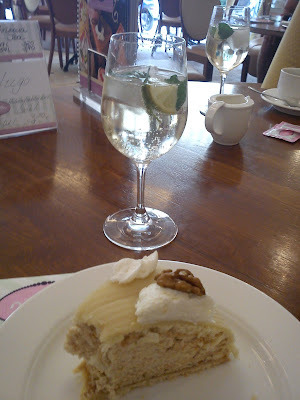 We had a Lübecker cream cake (cake with cream filling with walnuts and marzipan cover layer) served together with coffee/tea and a drink called "Hugo", which was sparkling wine with elder flower cordial, ice cubes, slice of lime and mint leaves. 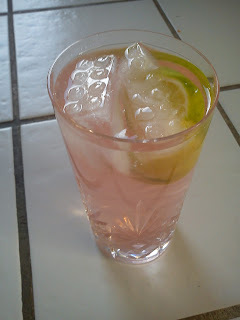 I will later share my version of such a "Hugo" drink. One of my good girl friends needs plenty of energy, as she is eager triathlete, and one of the things, which she really likes to eat is Digestive biscuit with Nutella and slice of marzipan !!! However, for me having a "sweet tooth" this combination sounds toooo sweet, so I have been staying away from this fast energy fix. Sometime during a short afternoon tea break I was served this specific combination with a strawberry twist, and I must admit I really liked this combination, which my girl friend referred to as 1-minute strawberry cake. So I am dedicating this extremely easy "cake recipe" to my good girl friend. 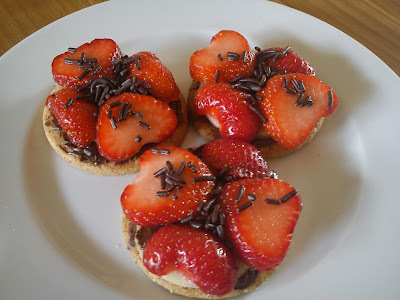 Finish off with adding chocolate sprinkles on the strawberry slices. I was introduced to this recipe on the drink called "Apple Mac" in the TV programme "Anne og Anders på sommerferie", and I noted down the ratio between whiskey, ginger wine and apple juice. As I already had one of the important ingredients in form of ginger wine, I decided to make this drink for the annual illumination evening. We started out with the original ratio between whiskey, ginger wine and apple juice, which was 1 part of each ingredients. However, the majority of the guests found it to be strong alcoholic in taste, so we decided to increase the amount of apple juice. And later on I did my best "to get ride of" the leftovers, I decided to made a slice of lemon to bring some freshness to the sweet apple taste. 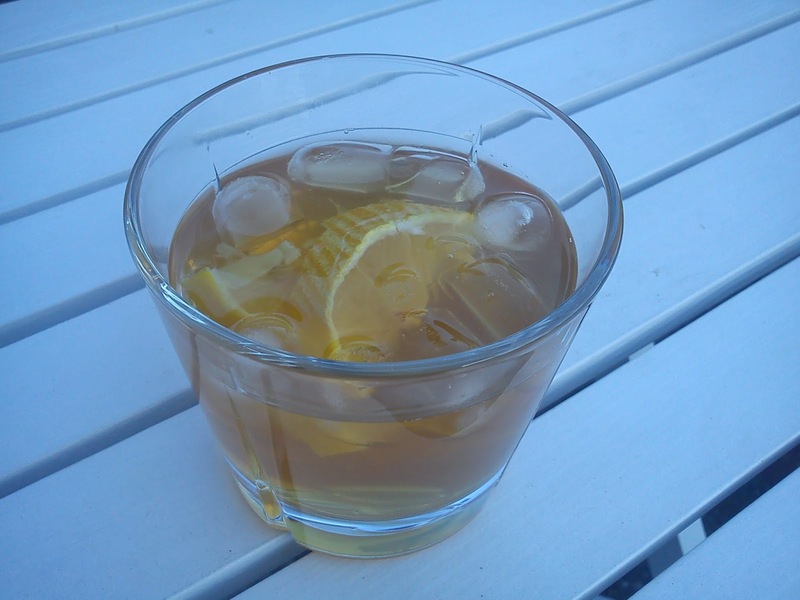 So I am sharing this recipe with you, which is the final drink after a few modifications. Another wonderful Kusmi tea is Sweet Love in it´s pink tea tin. 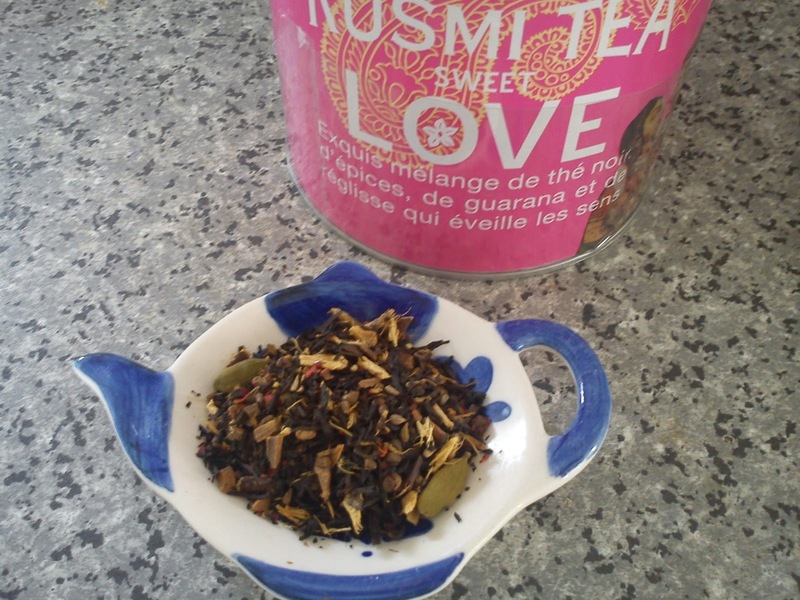 Sweet Love is an exquisite blend of black tea, spices, guarana and liquorice, that stimulates according to the text on the tea tin. The tea is made from black China tea, liquorice roots, spices, guarana seeds and pink pepper. I do not know, if this tea is stimulating my senses besides from stimulating my taste buds, as I drink yet another fantastic Kusmi tea.